With rapid innovation and almost daily disruption, it can be difficult to stay up to date with products in the renewables sector. What were yesterday's star products are being overtaken by new products (often from big named brands), which disrupt the market while drastically altering prices. To remain competitive, you have to remain current. The 2017 Solar Council Roadshow is a fun, information packed way to stay up to date in the field of renewable products including solar, battery and smart energy products and services. As Germany's market leader for home comfort solutions, STIEBEL ELTRON is proud to be displaying our WWK range of hot water heat pumps, which are solar PV ready and can be connected to a PV system via a signal wire. Using only 550 Watts, they can easily run off the PV system, leaving enough power remaining for other household appliances. The WWK range of hot water heat pumps when connected to an energy management system can be used as thermal storage for even greater savings. 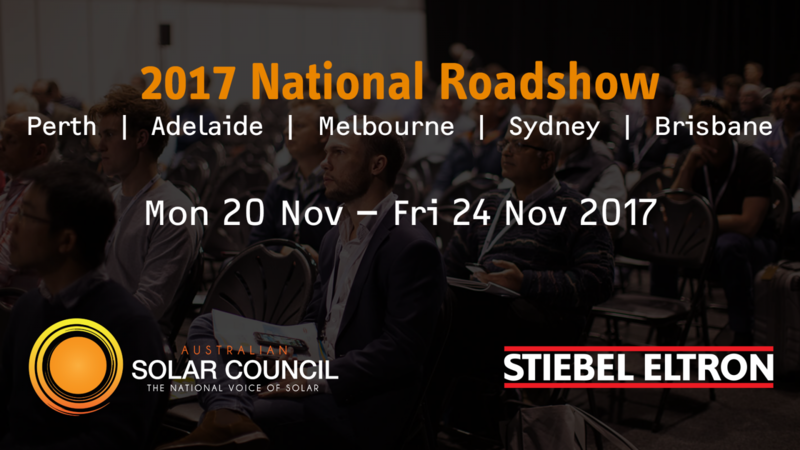 The 2017 Roadshow is free to attend for New Zealand Solar Council members. Click the ticketing link above for more information on how to attend. We look forward to seeing you there!